I actually received this game as a gift I believe from Choicest Games contributor Choona about two years ago but hadn't really played the game extensively until quite recently. So a big thank you to Choona is in order or else I may have never played this game. Plague Inc: Evolved has actually been in Early Access for quite some time (since 2014) and is actually based off as a mobile game called Plague Inc which was released in 2012. The game was a huge success which prompted the development of the game on PC with many additional features not available on the mobile version. After two years, the game was finally released which is when I started to take an active interest in the game (since I'm always a bit apprehensive when it comes to Early Access games or games in beta). The goal of Plague Inc: Evolved is to kill off humanity by creating a pandemic. You start off with a virus or bacteria that's not very deadly or infectious but over time as you start infecting more and more people you'll earn points that you can use to evolve your virus/bacteria into becoming more infectious or deadly. At some point, humanity will take notice of the virus/bacteria and try their best to stop its spread across the globe and eventually cure it. If humanity manages to find a cure to the disease, it's game over for you. 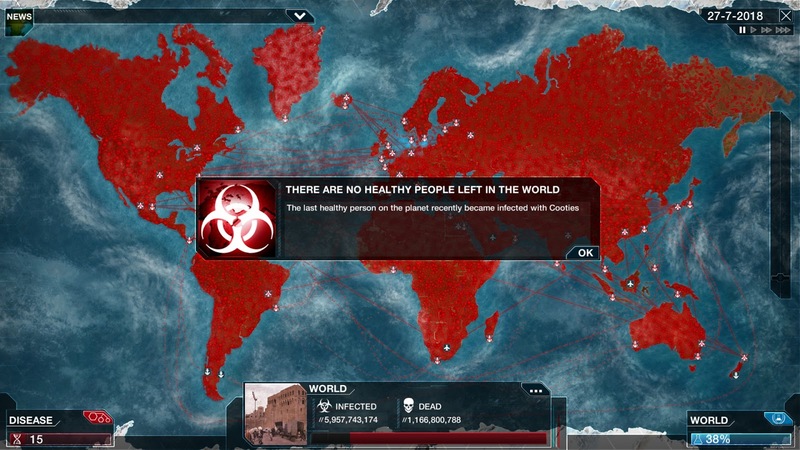 The game demonstrates how easy a pandemic can occur, so much so that the Centres for Disease Control and Prevention (CDC) in the United States invited the game's developer, James Vaughan, to give a speech in 2013. Vaughan spoke about how he modelled the spread of infectious disease in the game and how games like Plague Inc could be used to help educate the public. The CDC said that the game "uses a non-traditional route to raise public awareness on epidemiology, disease transmission and diseases/pandemic information" so it would seem that they agree with him. There's a board game called "Pandemic" where you have to co-operate with other players to stop the spread of an infectious disease across the globe. In Plague Inc: Evolved the roles are reversed and now you're responsible for spreading the disease instead. One of the spinoffs of "Pandemic" called "Pandemic: Contagion", is apparently very similar in terms of gameplay to Plague Inc: Evolved but since I haven't played it, I can't comment on how similar it is (or how good "Pandemic: Contagion" is). All I know is that the original "Pandemic" board game was good fun and one of the best board games I've ever played. The game even won a couple of awards in 2009 and the franchise is quite popular. Having the opportunity to play a game where the tables are turned is also good fun. The game is easy to learn since it's all mouse-driven and it comes with a helpful tutorial. You basically evolve your disease as it infects more and more people, and click on bubbles when you want the disease to start infecting a new region of the world. There are also research bubbles you can pop to hinder humanity's progress in developing a cure. The game plays a bit like a real-time strategy game except instead of directing tanks around a map you're enabling your pathogen to spread across the world. Why is it hard to master? Because humanity are eventually going to try and prevent the spread of your disease and develop a cure. One of the dilemmas you'll have to face in this game is finding a balance between a really infectious disease and a really deadly one. A really infectious disease might mean you're better prepared to kill humanity in one fell swoop but there are a lot of people on Earth to kill meaning a cure is likely to be discovered before you get a chance to succeed. Conversely, creating a really deadly disease will scare the populace sooner which means they'll start working on a cure early with little opportunity for you to infect the rest of the world before a cure is found and it's too late. I usually find movie tie-ins as gimmicky but this isn't really the case with Plague Inc: Evolved. The gameplay when using the Simian Flu is quite different as you'll have to eventually manage colonies of apes as they traverse around the world, trying to avoid drone attacks along the way. It's actually good fun in its own right. The game gives you the ability to play the game cooperatively and competitively. I've only tried the cooperative mode where it has you and another player evolving your own diseases. While the gameplay is similar to the single-player mode one neat feature about co-op mode is that you can evolve abilities that either help or hinder your partner's disease. I suspect that if these abilities are used effectively, you'd be able to help a partner's disease evolve qualities that would allow it to become more effective (if you have evolution points to spare). The game has leaderboards so you can compete against friends and Steam gamers in general by trying to achieve the highest score. You're able to create your own mods for Plague Inc: Evolved using the Steam Workshop and there are already quite a few available. The game has a whole swath of Steam achievements to strive for as well as trading cards to collect. As you can tell, I'm really clutching at straws here to find something negative to say about the game. I'm not talking about the difficulty (since the game is definitely a challenge especially at higher difficulty levels) nor am I talking about how easy it is to learn the basics of the game. What I'm talking about is the fact that all there really is to the game is evolving your virus and clicking on bubbles every so often - that's it. It doesn't help that the game is effectively based on a mobile game which is probably why it ended up this way. It's hard to fault Plague Inc: Evolved since it does so many things right: the game gives you the opportunity to be the stereotypical, evil mad scientist, hell-bent on destroying humanity and while this can be a challenge to do (especially on higher difficulty levels or if you're going for Greenland – friggin' Greenland…) it's quite easy to grasp the basics of spreading your virus/bacteria and evolving it. Add Steam achievements, trading cards, multiplayer (co-op and competitive), leaderboards and the ability to make your own mods, and you've got yourself a great value-for-money game that should keep you entertained for a long time. Is the game worth $14.99 USD? : Yes, despite each game itself not taking very long to complete, there are a lot of things you can do with this game that increases its longevity, such as hunting for achievements and trading cards, trying to beat high scores, playing with or against friends, and creating your own mods in the Steam Workshop.